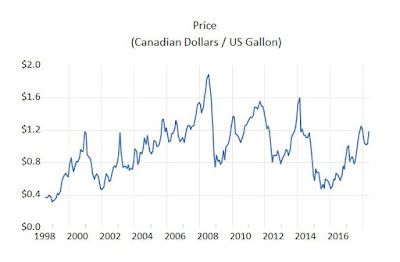 Anyone who's undertaken empirical macroeconomic research relating to Canada will know that there are some serious data challenges that have to be surmounted. In particular, getting access to long-term, continuous, time series isn't as easy as you might expect. Statistics Canada has been criticized frequently over the years by researchers who find that crucial economic series are suddenly "discontinued", or are re-defined in ways that make it extremely difficult to splice the pieces together into one meaningful time-series. In recognition of these issues, a number of efforts have been made to provide Canadian economic data in forms that researchers need. These include, for instance, Boivin et al. (2010), Bedock and Stevanovic (2107), and Stephen Gordon's on-going "Project Link". Thanks to Olivier Fortin-Gagnon, Maxime Leroux, Dalibor Stevanovic, &and Stéphane Suprenant we now have an impressive addition to the available long-term Canadian time-series data. Their 2018 working paper, "A Large Canadian Database for Macroeconomic Analysis", discusses their new database and illustrates its usefulness in a variety of ways. "This paper describes a large-scale Canadian macroeconomic database in monthly frequency. The dataset contains hundreds of Canadian and provincial economic indicators observed from 1981. It is designed to be updated regularly through (the) StatCan database and is publicly available. It relieves users to deal with data changes and methodological revisions. We show five useful features of the dataset for macroeconomic research. First, the factor structure explains a sizeable part of variation in Canadian and provincial aggregate series. Second, the dataset is useful to capture turning points of the Canadian business cycle. Third, the dataset has substantial predictive power when forecasting key macroeconomic indicators. Fourth, the panel can be used to construct measures of macroeconomic uncertainty. Fifth, the dataset can serve for structural analysis through the factor-augmented VAR model." Note - these are monthly data! And they're freely available. Although the paper doesn't appear to provide the source for accessing the data, Dalibor kindly pointed out to me that there's a download link here, on his webpage. This link will give you the data in spreadsheet form, together with all of the necessary background information. The only slight concern that I have about this resource - and I don't want to sound ungrateful - is the issue of the updating of the data over time. You'll note from the abstract that the database "...... is designed to be updated regularly through (the) StatCan database....". Given my comments (above) about some of the issues that we've all faced for a very long time when it comes to StatCan data, I know that updating this new database on a regular basis is going to be a bit of a challenge. Added 8 March 2019: I'm glad to learn that new update of the database is now available here. However, let's not let this concern detract from the considerable benefits that we'll all derive from having access to this rich set of Canadian macroeconomic time-series. Thanks, again, to the authors for constructing this database, and for making it freely available! Bedock, N. & D. Stevanovic, 2017. An empirical study of credit shock transmission in a small open economy. Canadian Journal of Economics, 50, 541–570. Boivin, J., M. Giannoni, & D. Stevanovic, 2010. Monetary transmission in a small open economy: more data, fewer puzzles. Technical report, Columbia Business School, Columbia University. Fortin-Gagnon, O., M. Leroux, D. Stevanovic, & S. Suprenant, 2018. A large Canadian database for macroeconomic analysis. CIRANO Working Paper 2018s-25. Gordon, S., 2018. Project Link - Piecing together Canadian economic history. Département d'économique, Université Laval.